I’ve had the honor of working on MVP’s Holiday series for a few years now. We approached this project a little bit differently this year. The main gripe I have with holiday discs is that people are out of the spirit as soon as January. In a way, they feel novelty. We decided during the thumbnail stages that we wanted to create a stamp that has a little bit of holiday flare, but not so much that it’s overkill. 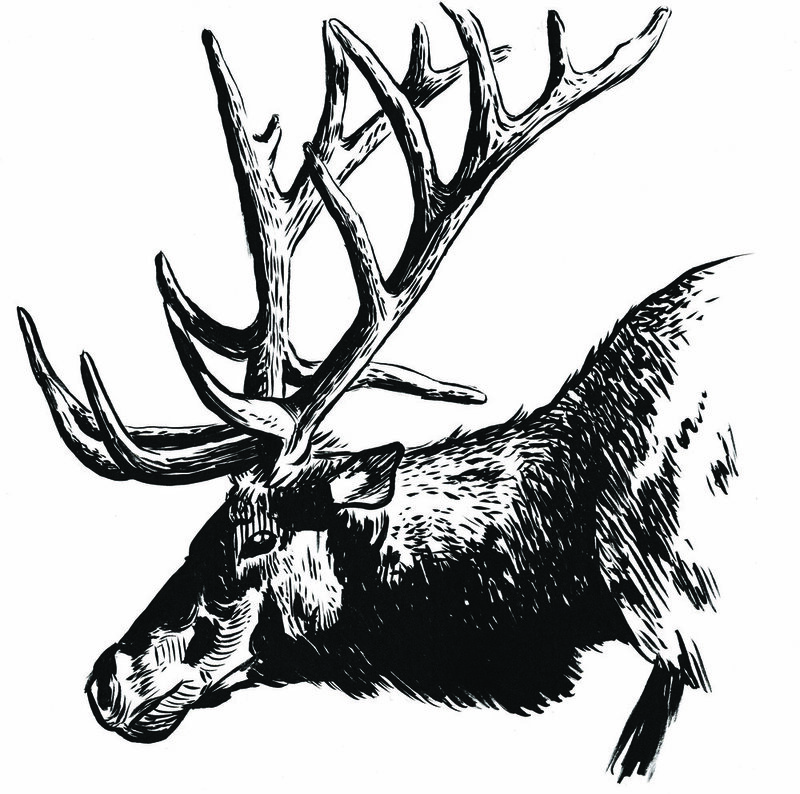 My initial design plan had this elk as a symmetrical stamp. Symmetrical stamps really help knock out details quickly and are pleasing to the eye. We decided that the shape of the antlers from the side really give this stamp some character. The single ornament hanging among his antler gives it that touch of holiday feel. The background comprises of flowing wind with abstract circular breaks that resemble snow. John Hafner is a photographer I discovered when trying to find some really good wildlife reference for this project. The way he captures light and subject drew me in. I feel strongly about using a reference if you don’t know much about it. You find more about certain things by comparing multiple images. Fur patterns, the way the antlers form, and can make out different details of musculature by viewing the same animal under different lighting conditions. His wildlife photos helped me immensely during the traditional stages. The last step before vector work was actually illustrating with traditional pen and ink. I used a Pentel brush pen on Strathmore Bristol board. Breaking this design into 3 different foils was pretty easy this time around. 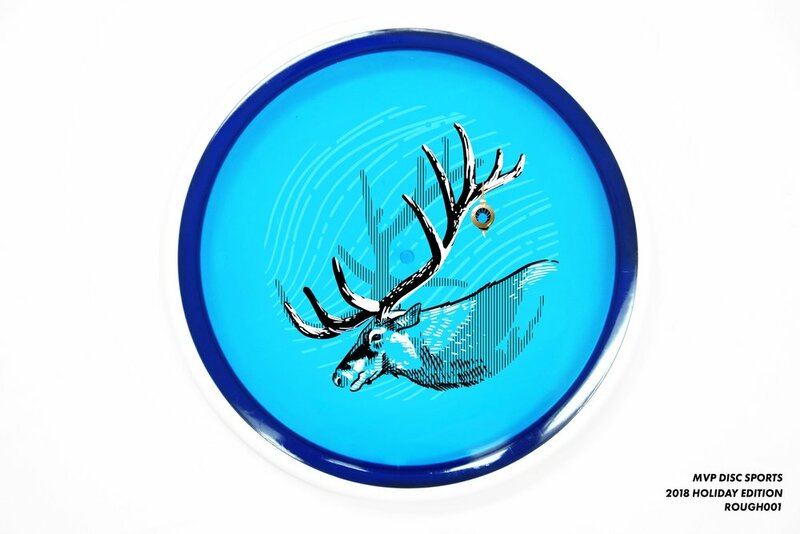 I knew with the illustrative style of the elk and the fact that it’s being stamped on Proton plastic; I’d want something that would work with all different color types. After mocking up the rough draft on a blank disc, I knew with this amount of surface area coverage that some reduction of the design needed to happen. It helps lessen the load on foil stamping machines and makes the warehouse staff happy. I used a simple line fill technique. The far antlers make the elk feel almost 3 dimensional by allowing some of the plastic color through the design. MVP Disc Sports ran half of the run with the transparent shatter foil. The clear shatter glistens in the sun similar to a fresh snow. It’s a great nod to a snowy season. The other half of the run had the gold holographic foil allocated. Let me know what you all think? Do you think going sideways profile with the elk was a good direction? Happy holidays, everyone. Thanks for reading.